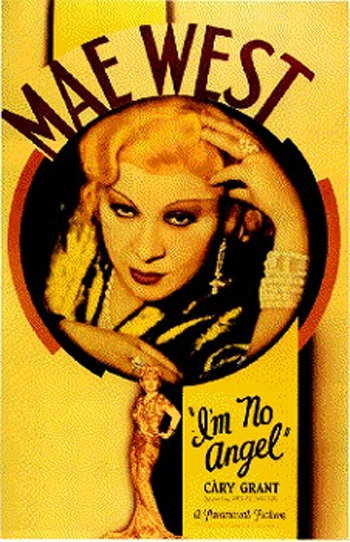 In the comedy classic, I'm No Angel (1933), one of Mae West's three best films, she was reunited with supporting star Cary Grant following their success in She Done Him Wrong (1933). (This film even surpassed their previous film's record at the box-office.) Appearing just before restrictions would be imposed by the Production Code on motion pictures, this was West's second original effort, and was partially written and directed by her. The funny plot directed by Wesley Ruggles, about West as a floozy lady lion tamer who makes it big on Broadway and hustles men out of their money, was an excuse to load up on the comical talents, quotable wisecracks and one-liners, and racy double entendres in her promiscuous dialogue, suggestive songs and body language. Now look, folks, you've got to give me your undivided attention because I want you to hear each and every word that I'm going to say. Over there, over there, Tira, the beautiful Tira, dancing, singing marvel of the age, supreme flower of feminine pulchritude. The girl who discovered you don't have to have feet to be a dancer. All right boys, just push right in there, you're gonna have a better view....Tira, boys! Tira! Just look at those eyes. Just look at those eyes. I said those eyes. Boys, she can assume shapes that will astonish a chiropractor! And next to her, a wiggling worm looks paralyzed... I can say without fear of contradiction that if Tira had have played the town at the time, Noah would have missed the boat....Boys, with the right kind of encouragement, she'll throw discretion to the winds and her hips to the north, east, south and west. It's the only show on earth where the tickets are made of asbestos. And now inside, Tira, the girl who makes your dreams come true. Step right up, men. No wisecracks, now. A penny for your thoughts....Get the idea, boys....Ya follow me? Rajah: You were born in August. She returns to her place that she shares with Slick Wiley. Although she lives with Slick, she also maintains a place away from the circus. He complains how cool she has been to him lately. He wonders why she acts so "high-hat," not wanting to help the circus by performing regularly with the lions, and for often being away from the show lot. As she leaves the circus grounds, an amorous trapeze artist makes a play for her. She warns him to be careful and not feel crazy about her when he's up on the flying rings. She fondles his arm, while reassuring his acrobatic partner: "Don't worry. I ain't gonna hurt him. I only wanna feel his muscles." The Chump: You're certainly givin' me the time of my life, baby. She gives him a long kiss.